Please calm down, I know I've been recently posting a lot of MAC lipsticks. I know, it's a problem, but I've been regularly downsizing and decluttering my lipstick drawer (yes, drawer) for quite some time. Instead of settling on lipsticks that I just like, I'd rather settle with the best. And MAC lipsticks are currently the best for me and worthy of my attention. Plus, how many times can you get a 20% off on MAC without a Pro Card? Perfect timing to try out oh-so-glorious Velvet Teddy and always flattering Modesty. Can you guess which one is which? Let's start with a pretty hidden Cremesheen gem, Modesty. Colour-wise, it's a medium neutral mauve rose with fine, almost undetectable gold shimmer. It's not a warm yet not a cool leaning lipstick. Shimmers are definitely not visible on the first glance but rather safely undetectable and great for adding that extra shine finish. As a Cremesheen finish it acts really creamy and buttery with a moisturising feel to your lips. 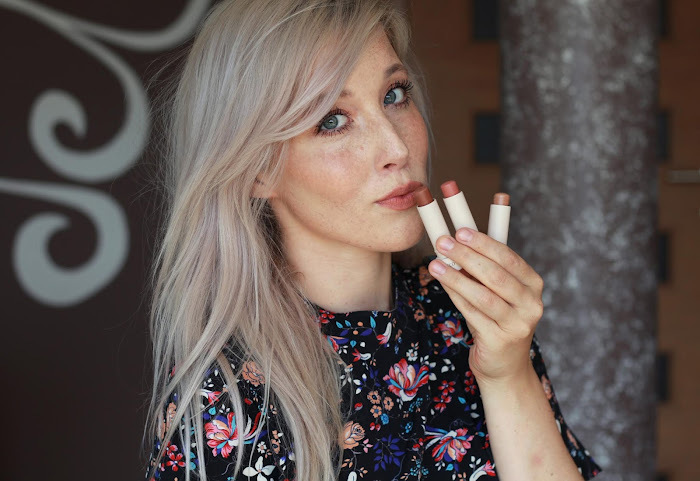 It's easy to wear, super comfortable and is reminiscent of heavy but creamy lipbalms. Due to extra creamy texture, it's not the most longlasting little thing but rather a standard wear-off lipstick that disappears within 4 hours. It's totally opaque with one application, while scent is strong after true vanilla. Velvet Teddy seemed like a true enemy of mine with prominent warm tones. Practically, I thought it would be a miracle to make it work on my pale skintone and not so warm undertone. I guess I was wrong because I still manage to pull off this warm-toned brown with pink undertone. It's not a match made in heaven but still pretty autumnal and lovely for this season. My fair skin makes it look much more brown-toned as opposed to other swatches and darker skintones. It looks a lot more neutral and pinker on medium or tanned skin while on me, it's almost-neutral brown. Still, it's a good intermediate stop before darker and rosier MAC Twig. Matte finish is one of the best benefits when it comes to Velvet Teddy as it stays put on your lips a lot longer than normal nudes. It lasts between 6-8 hours or one work shift which makes it pretty convenient. It's super creamy with application and starts drying out your lips after initial 3-4 hours. Again, classic vanilla scent is not missing. I'm happy with both, MAC Modesty and Velvet Teddy. 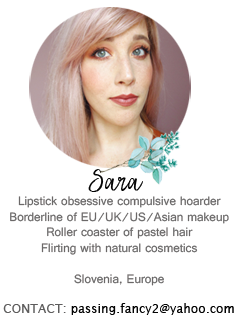 They are again, unique to my color scheme in my lipstick drawer but I believe you can also find lots of drugstores dupes for both. 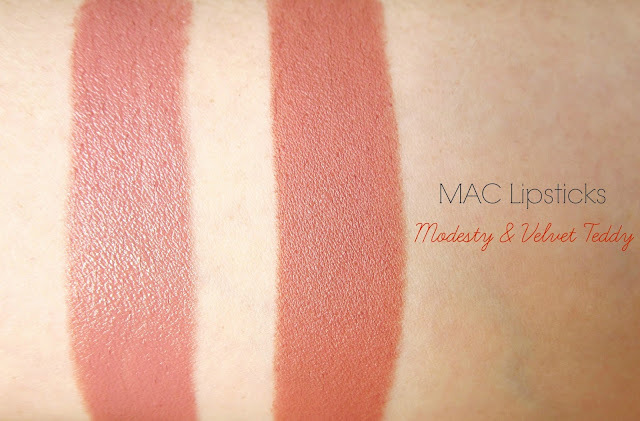 Velvet Teddy would be a perfect fit for warm-toned skintones while Modesty could suit any kind of skintone. Both are pretty neutral yet dark enough to accentuate your lip tributes but the choice comes down to prefered finish. Modesty will make your lips super juicy and plump while Velvet Teddy will coat them into a velvety smooth matte finish. MAC lipstick retail for about 20,00€ at your local MAC counters. I have velvet teddy but I think Modesty is such a nice color. Se mi zdi da Velvet Teddy zgleda na tebi še temnejši kot na meni :). Se mi zdi tak odtenek, da bo na vsaki koži izgledal drugače. Na meni je še tudi precej temen, ampak zelo všečen odtenek. Tudi Modesty is pretty. Kot lažja mauve verzija Velvet Teddyja. Oba odtenka ti ful pašeta ;). Lovely post dear! Gorgeous colors on you!